Hello and Happy Tuesday! 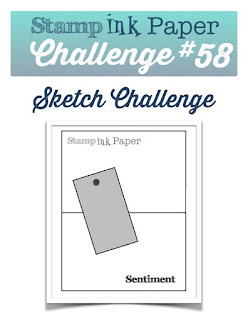 This week's Stamp, Ink, Paper Challenge is a sketch and I love sketches! I combined some fun Paper that I bought at Old Time Pottery with some Stampin' Up! Cardstock and a beautiful stamp from the Stampin' Up! Watercolor Wishes Kit. I just love the font in the sentiment stamps in that kit! Here's my card.. The Floral top layer on my A2 Crumb Cake card base is from a Printed Cardstock called the Fiesta Forever Stack from Old Time Pottery. It has a lot of pretty, color patterns and paired perfectly with this Tangerine Tango Cardstock. The tag was also front the same Printed Cardstock Stack. I stamped the flourish from the retired Stampin' Up! set, Everything Eleanor in Wild Wasabi Ink. 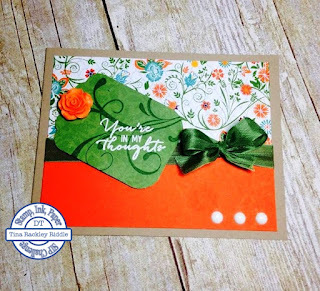 I heat embossed this awesome sentiment from the Watercolor Wishes Kit in White and added an adorable little orange flower from FSJ Beauty Blooms. I thought it matched perfectly as well. The seam binding that I used between the layers I think is in Wild Wasabi. I got it in a share probably two years ago and still haven't used all of the gorgeous colors! I love seam binding so why haven't I used it all?? lol Last but not least I added three white enamel dots in the lower right corner to finish this one off!